Skills and abilities: Expert hand to hand combatant able to defeat and track green Lanterns with the right technology. Powers: She can see the weakness in objects and other life forms. She has the power to instill fear allowing her to wield a Sinestro Corp ring. As a Star Sapphire she wields the sapphire Corp ring to great effect. Yrra Cynril was born into the ruling house on the planet Xanshi making her royalty. The planet had been ruled by her family for centuries. Xanshi is described as being “A planet of many Races” and a “Paradise” [Green Lantern v3. #84]. When she was little more than a girl her father sent her off world to be schooled on the planet Okaara where some of the best warriors in the universe honed her into a seasoned warrior. She was the first of her people to do so. At her coronation before she left the planet Racavood orchid’s were present and her boyfriend Dalia [Green Lantern v3. #132]. On Okaara he also realized she had a talent for warfare [Green Lantern v3. #84]. Fellow students included Starfire who would become a member of the Teen Titans and her sister Darkfire. While she trained however tragedy struck. Green Lantern of earth John Stewart made a fatal mistake which resulted in the destruction of her planet. Devastated she left Okaara against the wishes of her teachers to find out who or what had destroyed her planet. While she didn’t learn the identity of the being responsible she learned it had been a green lantern [Green Lantern v3. #84]. After this she channeled her anger and despair into action. She dedicated her life to kill all who would wear or formerly wore a Green Lantern Ring. Yrra branded herself “Fatality” since Yrra Cynrill had died with her planet [Green Lantern v3. #84]. She then cut a swatch of death through the ranks of the green lantern corps which didn’t end even after Hal Jordan left them powerless. When she arrived on earth after tracking the energy signature of the ‘last green lantern’ she found Kyle Rayner. In disguise she tried to seduce Kyle and kill him once alone. When he refused she attacked him but both were evenly matched as he had her beat in sheer firepower while she had more skill. She escaped and made her way to his power battery since without it he would be easier to kill [Green Lantern v3. #83]. With Lantern in hand she called out Kyle and defeated him in combat. Before she killed him he asked her why and she recounted her origins to him [Green Lantern v3. #84]. With John Stewart‘s intervention Kyle’s life was saved and she fled into space on her ship. Both ships after doing battle crash landed on a feral planet [Green lantern v3. #84]. When Kyle found her they fought again. He tried to reason with her and revealed that John Stewart was the one responsible for the destruction of her planet because of arrogance the same arrogance she was displaying in assuming that the death of the corps would bring her peace or bring her people back. When she refused to listen they were attacked by a monster. Refusing to cooperate with Kyle instead wishing them both dead she alone was consumed and she lost an arm [Green Lantern v3. #85]. Fatality was not dead however and she survived being eaten alive and replaced her arm with a bionic one [Green Lantern v3. #112]. She returned to earth this time to Kill John Stewart but found resistance from Jade as well as Kyle. During this battle she steals Jade’s ring and is able to use it in battle. 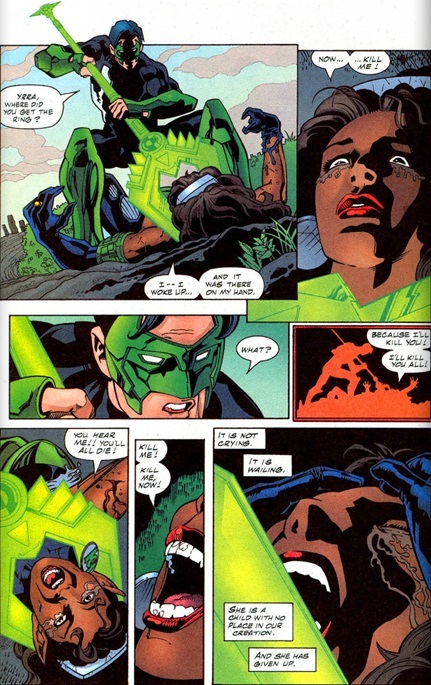 John Stewart then engages her alone and seemingly kills her in the depths of the ocean while using up all his powers [Green Lantern v3. #111 and Green Lanternv3. #112]. Fatality returns yet again this time in possession of a Qwardian Yellow ring [Green Lantern v3. #131]. Despite her new-found power memories of her planet had caused her to be mad to the point of being ineffective. She manages to find and beat up John Stewart and his girlfriend but can’t finish the job [Green Lantern v3. #132]. When defeated she begs Kyle to kill her revealing her self hate and death wish. When she tries to remove the yellow ring however it detonates destroying her other arm. While she was still in shock Kyle took her to Star labs where she got another prosthetic arm [Green Lantern v3. #132]. After being imprisoned she is visited frequently by John Stewart. On one such occasion she revealed to John that their was no physical problem with his body preventing him from walking. The entire exchange was very sexually charged and Fatality even took off all her clothes and flaunted her body before him [Green Lantern v3. #141]. When John returned to her he thanked her for aiding him in learning to walk again. She suggested she helped him so when she escaped from prison they could have a real battle [Green Lantern v3. #156]. Fatality is later released into the custody of a mysterious man who sets her free [Green Lantern v3. #176-177]. She tracks down Kyle Rayner and is defeated once more [Green Lantern v3. #178]. Years later she was recruited by Sinestro into the Sinestro corp and wielded a new yellow ring and joined the Injustice League. During the Sinestro Corps War she was captured by the Zamarons [Green Lantern Corps v2. #30]. Fatality is later converted to a Star Saphire. Free of her self loathing, hate and anger she sought out John Stewart Immediately and they shared a kiss in the debris of Xanshi. Yrra also tells John that she has forgiven him for destroying her planet [Green Lantern v4. 42]. She helps defend Zamaron when it is attacked by the Sinestro Corps. Fatality then joins the new guardians to battle the arch angel Invictus along side Kyle Rayner [Green Lantern New Guardians #1-12]. Leaving the team she aided John Stewart against the First Lantern and was instrumental in helping John reassemble Mogo [Green Lantern New Guardians 14-15]. They start a relationship soon after in the aftermath of the death of the guardians.